We want everything, we want it now, and — heaven forfend — we do not want to pay for it. We don’t want to pay for subscriptions to websites. We don’t want to pay to access records. And if there’s one way to get a record that costs money and another way that’s free, we’ll opt for free any day. The Legal Genealogist has a word for you on that score. Don’t cut corners. Don’t just go for cheap. Because there really are good reasons to spend the money and get good copies of original documents. And nowhere is that more true than when it comes to the many wonderful holdings of the National Archives. Don’t believe me? Let’s let the images speak for themselves. You tell me which one you’d rather have. Whoa, who’d have thought there would be so much difference. None of my ancestors had patents, but a collateral line did. I think I’ll pursue looking at the originals. I sure didn’t realize it until I did some serious research into patents and actually went to the National Archives at College Park, Patti. Couldn’t believe the difference. Wow! I had blogged about this when I needed to see the original of a Revolutionary War discharge at the National Archives, because the microfilm version was so awful. The original, and the photograph of the original showed that it was signed by George Washington! I have many, many patents from several ancestors, too, and so now I need to look at those original documents, especially the drawings! This is one big reason why I’m such a fan of the Preserve the Pensions effort, Heather — because they’re scanning rather than microfilming. The original colors and everything are being preserved. There is SUCH a difference with the original documents. This is also true with purely textual records such as the pension files. B & W copies or scans don’t show you that the ink on the page may be in several different colors, indicating that all of the writing wasn’t necessarily done at the same or by the same person. Also, bounty land warrants are beautiful as are some other documents. Its a shame to miss out on what they really look like. Absolutely, and as noted to Heather, that’s why I support the Preserve the Pensions effort — they’re scanning in full color. And maybe spring for a genealogy road trip! Just down the road from me in Cazenovia, New York, is the beautiful Rothschild Petersen Patent Model Museum! (http://www.patentmodel.org). 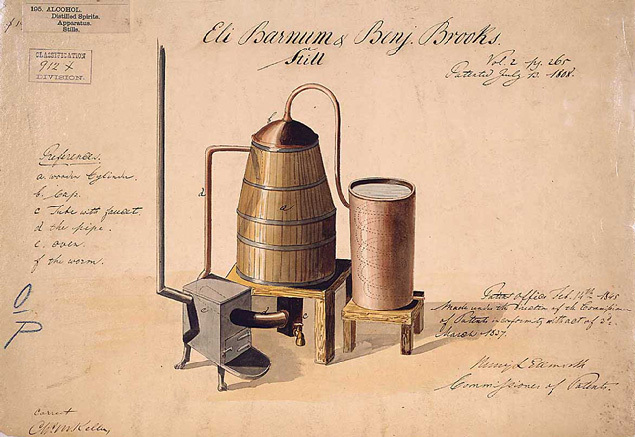 During the 1800’s inventors had to send in a model of their invention, and some of them are still in existence. I took a tour in law school, and it’s just an incredible collection. I was hoping to see my ancestor’s “Improved Breast Collar” for horses, but no such luck. Now that is a very COOL idea, Blaine! I knew about the models, and also knew that unfortunately many many of the early models went up in smoke in the 1836 or 1877 fires at the Pension Office buildings. Glad to hear that some of them survive and are still around! There have also been display models made from the original patents by museums. 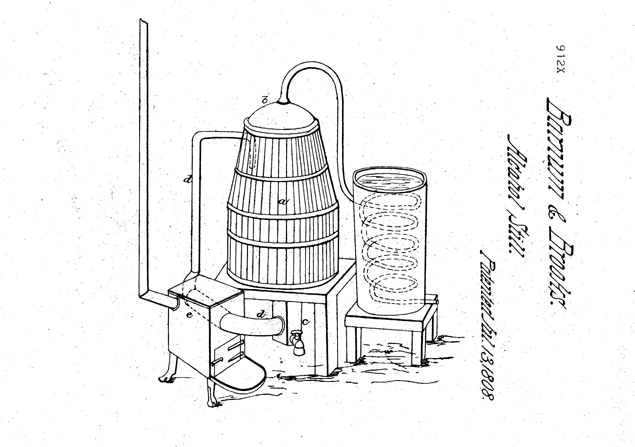 A collateral ancestor invented an early artificial ice maker around 1860 in Australia and patented it in other countries including USA. The Smithsonian made a model but was not using it and the grandson of the patentee managed to have it donated to a major Australian museum close to where it was invented. It’s not the original, but the 3D solidity of a model helps envision the original in use. That’s really neat! And yes, definitely, the models help visualize the items nicely. It isn’t that I don’t want to pay, I can’t pay everywhere. I have to choose which things I can afford. I got a huge disappointment with a marriage license. Since there were others listed on the page I got a cut and paste from the state of Iowa. It was horrible and cost me $25. I had seen the transcription at the local courthouse and it have all the information. Now I have to plan a trip back there to write all that information down on paper since I was not allowed to photograph or copy it. Keep in mind not everyone has unlimited income. Genealogy is not a cheap hobby. okay — I’ll play the part of the dumb reader. 1) How do you ‘know’ if the patent you are interested in actually has the fancier drawing(s) pictured in your examples 2 and 3 above? Up to today, I just thought they were all basically your example 1. 2) Would someone mind directing us to where we might find how to order microfilm of the patents ? Sorry for abusing your blog post, Judy, but I bet I’m not the only one looking for a short cut to these excellent example 2/3s to further my research! I too never would have thought there would be such a marked difference in quality and amount of information between the online image and the original image. One of my cousins was an early woman inventor, and thanks to your post I’m adding “a copy of her original patent” to my genealogical wish list. This really is a case of a picture being worth 1000 words, isn’t it? I already heard back from NARA, so I thought I would post an update here in case others find it useful. They told me the exact citation for the image I want scanned, and said that I will need to either visit in person or contract with an authorized third-party vendor. They included a list of authorized vendors for their branch, and said that it costs at least $30 to have a vendor do it, with the exact price depending on the specific image. Excellent, Liz — and $30 is quite reasonable for an on-site, in-person bit of imagery! Do I really need a picture of the still (or any still), or would it be better to spend the money on what comes out of the still (or any still)? Hmmm… Maybe both are worth it. Thanks for this post Judy. Very informative indeed. I don’t know that any of my ancestors had patents because I haven’t explored, but now I will know what to look for. Judy, this is a phenomenal example! I have learned to be very judicious what I spend money on. And, it does need to be spent. 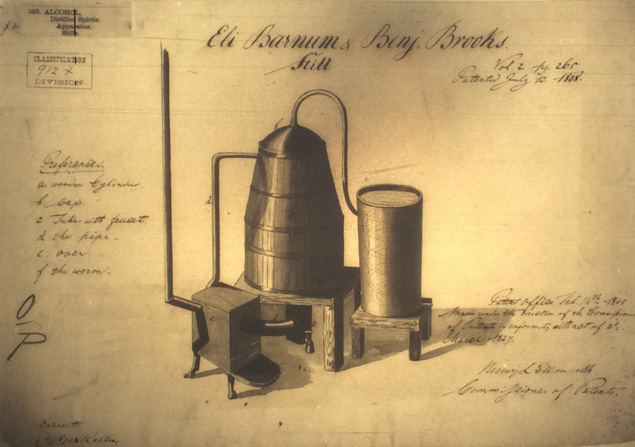 Would the picture of the still help me in my research? Probably not. But, what a rich example that could be included in a family’s history! On a side note, I do believe that research trips are very important. There is just something about walking the land that a grandfather walked. I have been fortunate enough to photograph a homestead that was built by a grandfather in the 1800’s that probably wouldn’t be standing much longer. I could see the hewn logs, the mud chinks, and even got one of the locals to go in and photograph the fireplace built with the bricks he had made. I stood where another grandfather had been murdered by Indians, looking at the same hills and land that he was looking at before he took his last breath. Just looking at photographs would not have captured the feelings that washed over me as I felt myself transported for a few moments. Oh, I am so with you on that, Peggy! I will never forget standing at Wiseman’s Ridge, NC, above the Linville Gorge, looking down and wondering how in the name of all that was holy my ancestors managed to end up there. I will certainly go back and see if I can get the better photos. BUT do you have any hints on how to tell which William Johnson is mine!!!!??? As the descendant of a man named John Jones and another named Mathew Johnson (kin of yours, perhaps? ), I feel your pain. There is a brother named Mathew also in DeWitt Co., I’ll. It sure would be nice if that was my Mathew, but mine (I am sure) never made it north of the Mason-Dixon line: born in Virginia, lived and died in Kentucky. My John Jones was dropped off by aliens about 1729 in southwest Delaware. No others by that name in the vicinity, but derned if I can find a single clue to where he was from . . . .